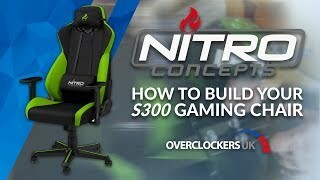 The Nitro Concepts S300 Gaming Chair is setting itself apart with its new unique combination of vibrant colour designs. Combined with premium materials, gamers won't just be able to make exercise their imaginations, they can also expect a wide range of adjustability options as well as optimum ergonomics. The Astral Yellow variant is coated in a durable cover which is soft, high-end and extremely breathable. In combination with the porous cold foam upholstery the S300 gaming chair offers a pleasant seated experience on warmer days. For every other day the deformation resistant cold foam provides a high degree of comfort even over long periods of time. More links for "S300 Fabric Gaming Chair - Astral Yellow"
Got rid of my old office chair and replaced it with the s300, and the difference it has made to my back is incredible! Thanks Nitro Concepts!